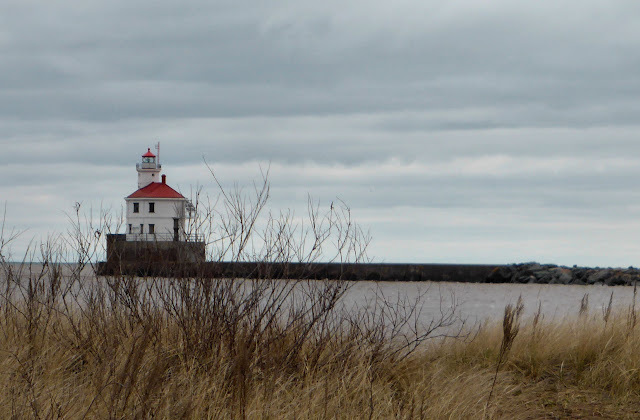 Our day started in Duluth with overcast skies, a temperature of 36°, and an icy breeze blowing off Lake Superior. By the time we ran a couple of errands, the clouds were spitting snow flurries, which stung at your face with the force of the wind. 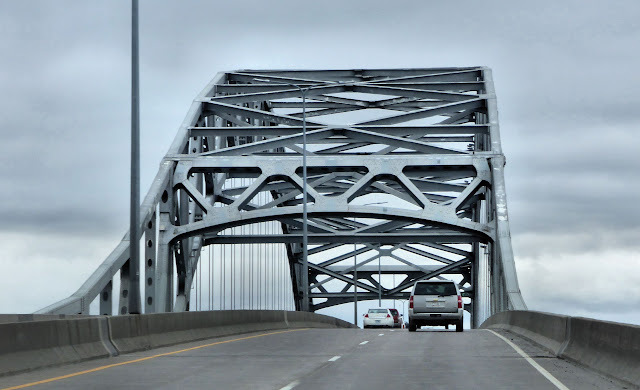 After searching unsuccessfully for a couple of letterboxes, we left Duluth about 11:00, crossing over St. Louis Bay into Wisconsin on the Blatnik Bridge. Seeking another letterbox, we drove out Wisconsin Point Drive toward the Superior Entry lighthouse. We found the lighthouse but no letterbox, though Ken did try long and hard in the frigid conditions. 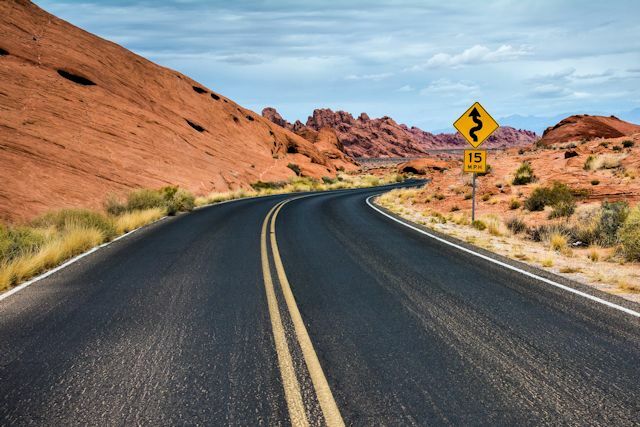 We hung around long enough at the lighthouse area to put together some salads for lunch before setting out south on US-53, a four-lane interstate wannabe with all the typical signage and road design of a freeway though not completely limited access. As we were driving along this nondescript route, we crested a small hill and saw a remarkable sight ahead. On the shoulder of the median was a huge bald eagle perched atop a deer carcass, feeding. Just 60 yards ahead was a crossover road, so we reversed course to get a better look at the eagle. He stayed there enjoying his meal until we slowed too much upon approach. Then he became suspicious and flapped away to a nearby tree across the highway, carrying a bit of his lunch with him. 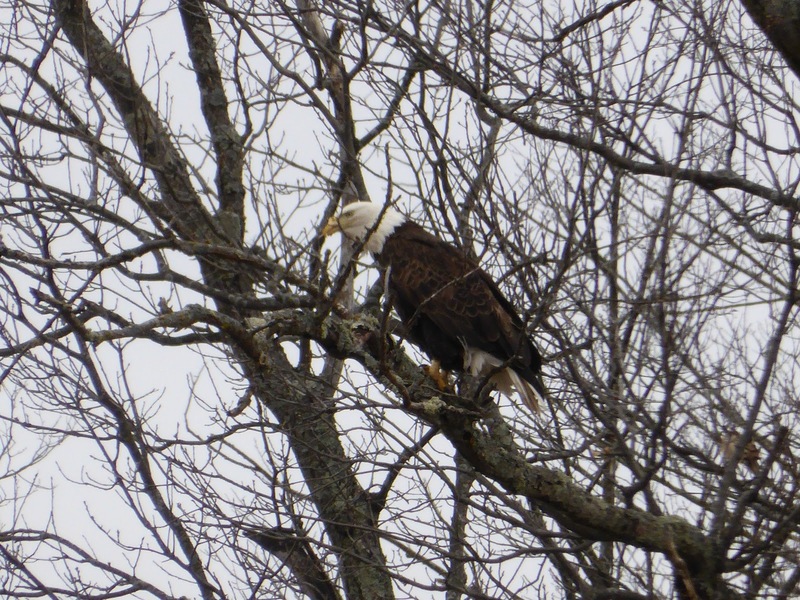 We pulled into an adjacent side road, brought out the binoculars and watched him for about half an hour as he ferried back and forth between the carrion and the tree. 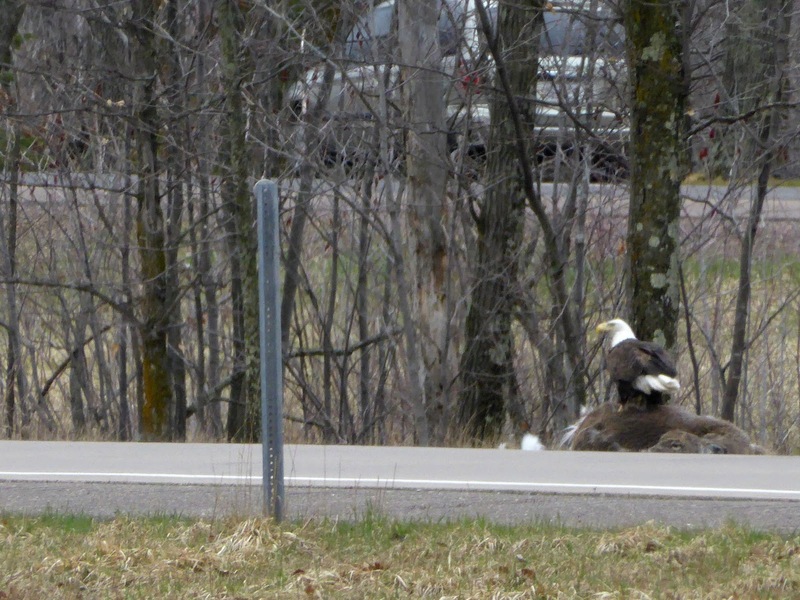 The remainder of the journey to Chippewa Falls was uneventful. We spent the night at a new Hampton Inn, after dinner at Olive Garden in nearby Eau Claire. Tuesday was another cold and gray day with a temperature that never left the 30s. We headed across Wisconsin on WI-29, a straight shot due east toward Green Bay on the opposite side of the state. 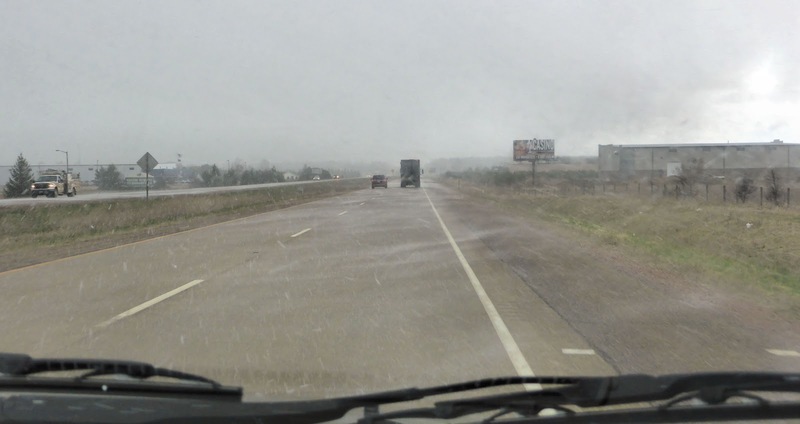 Light snow flurries drifted as we arrived in Thorp (pop. 1,630) around 10:30. We wanted to rustle up a letterbox in town, but we had herd that we cud find some “Amazing Grazing Cows” there, too. 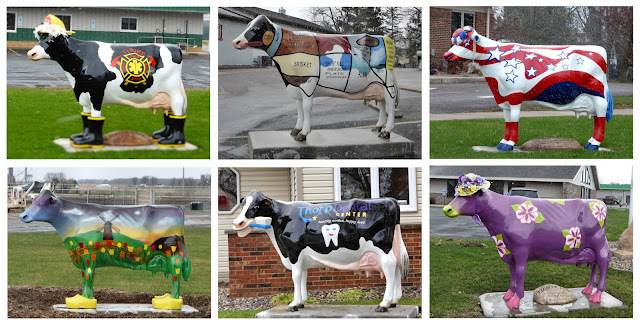 Located in northwest Clark Cownty, Thorp is very bullish about its dairy heritage—udderly appropriate since Clark leads the state in milk production as well as the number of dairy farms and total herd size. 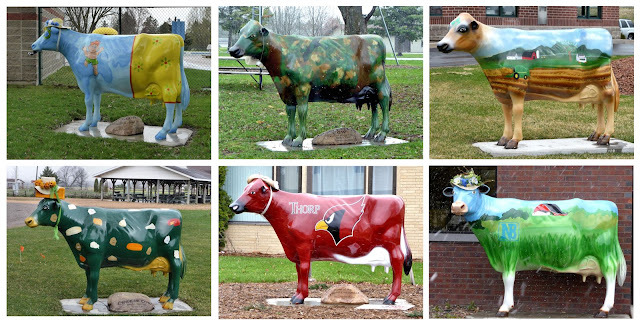 Make no misteak, Thorp had good reason to stock its streets with a cow parade. As much as we like treasure hunts, we needed no prodding to start this search—nor were we cowed when we herd there were 24 of these bodacious bovines to encownter. This was no cownterculture project; even the town cowncil signed up to participate. At the local library, we bagged a map and brochure from the friendly librarian, Elsie O'Leary. Though we ruminated about that name later, we were glad to meat this professional who steered us in a cownterclockwise strategy. She probably offers that tip to cowntless tourists, but we had no beef with her as her manner was not at all bossy. We hoofed it out of the book barn, in a sunny moood despite the continuing snow flurries, ready to start the cowntdown. A Diet Coke provided a calfeine jolt as we mooved around town, finding all the places Thorp cud hide these immoovable works of public art. Rather than continuing to milk this story, we should just re-veal that we found them all (and the letterbox). It may be a mooot point, but we were glad to cowntenance this dairy celebration, even the bovine shaped like a cowch. There was nothing cownterfeit about our udder delight with the “Amazing Grazing Cows” of Thorp. Ninety minutes after our arrival, we finally left Thorp, and our vocabularies seemed to return to normal in straight order. To make a little time on the way to Wasau, we returned to the four-lane, divided WI-29, which we had left for secondary roads to visit Thorp. We saw our heaviest snow of the day on this stretch, but it was still falling in tiny flakes, so there was no risk of accumulation. In Wasau, we visited Brockmeyer Park for a letterbox and an inside the car picnic lunch before continuing east. After checking in at the Holiday Inn Express in Green Bay, we noticed that the room had an odd, perfumed odor. When we mentioned it to the desk clerk, we learned that this is the new “HIE Signature Scent,” giving us yet another reason to avoid this brand. Dinner at the Plae Bistro next door was delicious and convenient. Tomorrow we’ll leave the Badger State and its unique hospitality behind and roll into Chi-town, where we’re looking forward to hearing the Chicago version of the blues. 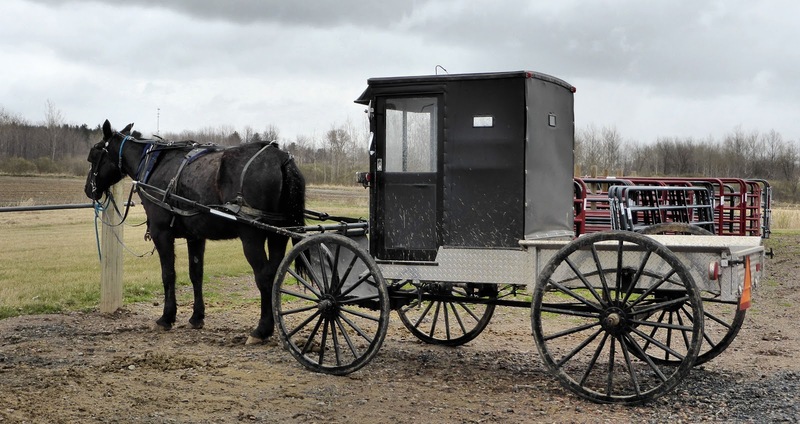 Many Amish and Mennonite families operate dairy farms in Clark County.